The Federal Government has announced it will contribute $2.2 million to the three-year pilot project, which will result in solar-powered rotators being placed at Moore Reef off the coast of Cairns. 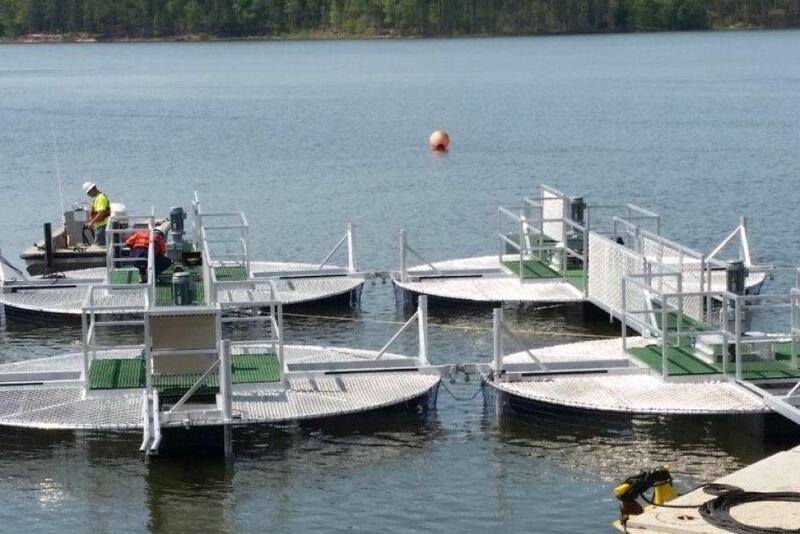 The slow-moving ReefMix fans mounted on floating pontoons create water currents by gradually drawing cooler water from up to 30 metres below to the surface. Anthropologists of the future can study this as a primitive turn of the century fantasy. Some old folks are missing out on air conditioning and heating because they can’t afford it, but a few lucky zooxantheallae will be spared from their natural fate. The field trial is designed to protect a 1 square kilometre patch of reef from the worst effects of bleaching. “This intervention will never save the whole of the Great Barrier Reef, but it will be important for some of our particularly valuable tourist sites, which of course are 64,000 jobs,” Ms Morris said. The Great Barrier Reef covers 344,400 km2. Thie $2.2m cost may protect 0.0003% of the reef. The cost to “protect” the whole reef would be $757 billion dollars. The turbines are planned to be constructed in Cairns and installed in February, and are being jointly funded by the Federal Government and the tourism industry. Hands up any business in tourism that would have spent the money differently? PS: Can any readers find links to the US versions? Future anthropologists and others will be trying to analyse the collective madness that overtook the world in this era. Did my post go into moderation or just get lost? Just in case it was finger trouble on my side, I’ll re-post and see if that works. While this isn’t about the reef, it’s related in so many ways: https://newatlas.com/chargery-bicycle-trailer-electric-vehicle-charging/52519/. You’re assuming the future humanity will be smarter than it is today? I sware, humans as a race are getting dumber by the year. My prediction is thus: The best minds of the future will all be like Lewandowsky. Tourism industry contributing? If so, presumably virtue signalling, but it won’t work. Feeding one lot of possums just attracts all the others. Perhaps this really is just a tourism advertising plan — look at it that way — spend $2.2m, get free news headlines and coverage, pretend that the reef is “protected” so it’s safe to visit. It undoes some of the bad bleaching publicity (nobody add up the numbers). The pedant in me says this is more like water conditioning rather than air conditioning, but I get your drift and the entire thing is unbelievably crazy. My gut feeling is the reef will cope but the 2.2 mill is smoked. It would be a tourism promotion if it were funded by the Australian Tourist Commission (Tourism Australia) and/or Tourism Queensland. Bur remember, the current Treasurer “Scomo” Morrison was the head ad-man at Tourism Australia before he went into spending tax-payers money big-time as the Treasurer in the most useless Liberal government the country has ever experienced. You’ll notice that under Scomo’s watch the Commonwealth debt has increased about 20% to well over $600 Billion (and growing) and the Budget is still in a massive $37 Billion annual deficit. What’s a couple of extra Million in that little hole when it gives the Warren Entsches (North Queensland MP, on a thin margin) of this world something to feed to the local swingers? Oh, and I should add. Once an ad-man always an ad-man. There’s no problem that can’t be fixed with more advertising. In other systems it’s called propaganda. I’ve read this several times and I still can’t believe it. It will be interesting, very interesting, to see what “unexpected” damage/change is caused. hasn’t been even more harmful. Thing which struck me was that doing this might be part of government action to try and convince a gullible public that its (disastrous) renewable policies are necessary. I’m not laughing at the thought of over $2 MILLION DOLLARS of taxpayer funds being basically flused down the toilet ! Agree, Angry. This is like lowering the sea level with a bucket brigade of 3 three 6 year old kids. Utter nonsense, waste of time and money, and keeps those in need from getting help. A petition has been running since March to get the Queensland Environment Minister to pour cold water on this experiment on our reef. Presently it has 508 signatures. Please share widely. What a weird dream – huge batteries, giant fans, windmills. I wonder when I’ll wake up? Does OZ have a Sancho Panza of the Reef? No, we have about 500 under various aliases. And speaking of asses…(No, I would be moderated). No. But we have Scomo Ponzi pretending to be a Treasurer. However, like Don Quixote he also tilts. In his case to the left. With a wave of my mighty hand I direct the circumpolar current Northwards. Problem solved? No No don’t solve it. My life would not be the same. The one constant thing that has never changed as long as i can remember is that the reef has mostly died or is dying and will not recover etc. It is one of those constant norms, a stable state that has been going on that way as long as I can remember. Please don’t cure anything. Sliggy the1954 report also mentions an earlier expedition but the ink is so badly smudged I can’t make out the name or date but looks like Tonga expedition of 1926 . Could be a reference to the earliest natural state of the Reef . Temps seem to be the same as today , you have found some interesting articles here that’s for sure . Surely this is worthy of a story in itself Jo ? flooding in the Fitzroy River. It looks like the reef could need a good bombing. 1951 “On making a check since his return, he had found that a proclamation had been issued in November, 1943 declaring Fairfax Island an R.A.A.F. bombing target. Well we use good intentions to save our planet and its inhabitants from warming so we installed wind farms that chopped birds up then we invented solar arrays that fried birds now we want to pick on fish and make sushi . Not only the fish, Robert, but think of all those other sea creatures doomed to be sliced and diced by the whirling blades – whales, dolphins, and worst of all, sharks! Will man’s inhumanity to sundry creatures of nature never end? What can we expect if the sea gets colder? Heaters? And what say some lime feeder to combat the “”"acidity”"”. So what will happen when global cooling sets in? Will they turn them into giant heaters? Just let the climate be the climate and the politicians be …., well you know what. As you know bleaching is caused by a drop in sea level, happens during strong El Nino. so we need to build a concrete wall around the shallow coral to prevent this happening. They will need to be quick, global cooling has begun and sea level is bound to fall. Well it looks like volcanoes are on the rise. The Siberian one is now active. If Martin Armstrong is right there will be many more over the next couple of years so we should see significant cooling by then. If so there could also be food shortages as crop yields decline. It’s probably too late now but the smart thing would have been to stockpile wheat and other commodities big time. Of course we never do the smart thing given the total lack of vision of our leaders. Australia is bound by international treaty to maintain a minimum of 60 days crude oil usage in case of trouble in the Middle East. You know those International Treaties that are sacrosanct e.g. the Paris Accord, various ‘donations’ to the UN bottomless pit etc. so how is this Treaty observed. Presumably it has been filed somewhere in Canberra because if there is trouble in the ME we will be the first to run out of oil. Mind you, we’ve shut down most of our refining capacity as well. If they ever showed the ability to think ahead I would say it was planned by the Greens but in the absence of any rational thought there it is probably another Green mighty stuff up. According to the Dept of Environment, Australia has about 50 days of petroleum imports coverage. Back in 2010 when we had more oil refineries we had close to 90 days. Back in Sept. 2016 I was told that we had 21 days. Warming, cooling, sea levels rising, sea levels falling, all against some mythical norm. I am waiting for “La Mano de la Mancha”, to enter from stage left. I actually wonder what the full cost is if the Feds are kicking in a $2.2 million contribution. Also important was the wailing about the Reef being dead in 15 years . They look as though they may be real wizz bang Frisbees in a cyclone. What great FADS (Fish Attracting Devices) then following the next cyclone, artificial reefs. Can we also put some windmills at the other side of the area to harvest the wind? They need to put some wave generators out there and connect them to the fans and they’ll have a perpetual motion machine. Oil rigs would be far superior. Ooh thank you Mr Turnbull, well worth the money. MALCOLM ABDUL TURNCOAT TURNBULL……..dead man walking………. Who knows how and why these things get funded? The trail leading to the diesel subs seems to lead back to the French being forced to stop providing chopper carriers to Russia and then sell them too cheaply to Egypt instead. The ridiculous SA deal was some sort of compensation negotiated by NATO or god-knows-who. Maybe. There is probably a reason for this shocking waste (and possible damage to the reef) but waste, unlike thrift, tends to be a convoluted affair, with good money following bad, a mix of extortion and blandishments. Someone dumping a budget? A tax break or regulatory loophole? Like when the Danes were making oil out of sand eels? Like when the Poms were forced to chip, ship and incinerate American forests? One thing is sure. Being green has nothing to do with conservation. Conservation is now a forgotten value. Coserve ation is about conserving, or being conservative, don’t forget who we are talking about here. Your local SJW is nothing like a conservative. I am not a big fan of this proposal. I would prefer to see tax payers funds directed to feeding Santa’s reindeers XMAS eve. Obviously the current “advisors” that the federal “government” are using are deranged lunatics residing in padded cells in mental asylums !!! SO ANGRY WITH ALL THIS CRAP !!!!!!!! With the cost to “protect” the whole Great Barrier Reef coming in at $757 billion dollars, it could be more sensible just to ignore the whole idea. Even if the worst does happen, we could just content ourselves at looking at the old photos or visit the ones of Kimbe Bay New Guinea which do not seem to be in any trouble although they are in hotter water. 50 Billion of it may be to buy the new submarines, which could then be used to tow icebergs from Antarctica to the reef. They could also load ice, shaped like torpedoes, into their tubes, and fire the ‘torpedoes’ at Crown of Thorns starfish. That’ll show ‘em! Rail companies could cut their costs by millions of pounds a year by installing trackside solar panels to power electric trains, enabling them to cut fares for passengers, according to a report. Installing solar farms and batteries alongside lines also could provide the extra energy needed to power more carriages on busy routes that otherwise would require prohibitively expensive upgrades to electricity networks. The study, by Imperial College London’s Energy Futures Lab and 10:10, a climate change charity, found that it would be commercially viable to meet 10 per cent of the power required for traction on Britain’s electric railways by installing solar arrays without any subsidy. The world seems to have reached PEAK STUPIDITY………. No not yet Angry but they’re working on it as fast as they can . Just wait until Mr. Musk starts breeding. He already has tomomason, six of the little blighters at last count. They breed like musk-rats those multi-citizenship holders. We left peak stupidity in the dust years ago. We are now well into the times of irreversible idiocy…. Ahh destroyer you got me thinking , why not try drenching the Reef in a sports drink because it’s got everything you need . The spray can guys would have a field day, amazing amount of graffiti on anything alongside a railway track, this would give them oa whole new canvas. That would be the mob who released ‘No Pressure’, the blood filled short film that blew up school children who dared to suggest that CO2 wasn’t completely evil. Good to see they are still around and still in the comedy business. What annoys me with crazy ideas like this is that when the reef recovers in the next 12 months or so which would be inevitable if we do nothing, these idiots will think that it was due to spending money on these fans. Then they will start putting these things everywhere. More money down the global warming drain. Being practical, rational, realistic, sensible and careful with tax payers funds when it comes to academically promoted Coral Reef science will get you no funding, no respect, no reward, no academic advancement [ the opposite will be the case ] no approval for future projects, no travel and conference expenses approved , personally ostracized and ignored along with a casual disregard and dismissal of any of your papers along with an outright refusal to publish those papers no matter how much impact they might have. This is after all is how much of scienceqworks today, particularly any science that has even a hint that it might be connected to the Climate catastrophe we are all waiting so earnestly for which over the next 100 days,etc- etc- etc – to unfold and destroy all life and the 4.5 billion year old planet. Worm greenhouse emissions (primarily methane) from our global ocean sediment buddies could lead to that proverbial tipping point – initiating a runaway global warming and catastrophic climate change scenario. It’s no show without the old “tipping point”. Well, after the end Permian extinction there were clams everywhere on the sea floor** AND the temperature went up. It’s true there was a short ice age but who’s to say if that mightn’t have been worse but for the flatulent clams, whose output would have been quickly converted to the dreaded CO2. And the warmth continued for millions of years, going up as the CO2 increased, going down as the CO2 shot up, going up as the CO2 came down. ** Owing to the lack of animals that could eat them. Indeed there weren’t such animals for millions of years but when there were, that species of clam was nearly wiped out. Fortunately without affecting the rise in the Temperature. But we have other emitting sources, notably all those bean eating believers in AGW. Emitting methane at one end and CO2 at the other…quite irresponsible. The Government needs to spend millions placing them under 20 feet of sea water for a year long trial. The government has slashed the level of subsidies that developers of big batteries will receive to help to keep the lights on, after concluding that the products may not last long enough to prevent a blackout. Ministers have been backing the development of giant lithium-ion batteries, which can help to balance supply and demand on the grid by storing surplus electricity for use at times of scarcity. Most batteries built in Britain can provide their maximum output for only half an hour to an hour, however. New analysis from National Grid shows that a power shortage crisis would be likely to last two hours. As a result, the government said yesterday that it was significantly reducing the level of subsidy that such limited-duration batteries could secure through its “capacity market” scheme. The change could make it harder for some proposed new batteries to go ahead, as generally they are not commercially viable without some sort of subsidy. Ministers said that it would “reduce the risk of insufficient capacity being secured”. Those SA batteries are getting a daily workout up to 30 MW. Does that dialy 30Mw cycling count towards the total number of charges/discharges that determine the battery life? At 1500 cycles it will last less that 5 years. O/T But the new 50Mw super solar array in Queensland only manages to contribute 10Mw most of the time according to the AEMO web site. If the batteries are ‘not commercially viable without subsidies’ then surely they are simply ‘not commercially viable’; end of story. As I said in the last thread Silverton is the home of the mad max museum so it’s sort of fitting . No sign of any works when we were there in may /June but it will change the landscape for the worse . Well, pat, I didn’t need to read to the end of the sentence to know which country would definitely not be on the list of manufacturers. So the road bypass was built using … hmm diesel, and the trucks run on hmm diesel and cranes they need to lift them into place run on Hm diesel and the blades are made from hmm Carbon, and Hmm oil and solid electricity (aluminium and glass fibre) then the environment has to be flattened for a few hectares around them reducing sinking of Hmm CO2. Anyone see a trend here, anyone wonder whether these will save an ounce of CO2 because they WONT. But isn’t Silverton a superb location. It is not a windy area. It will be 20kms from the nearest “population centre”, Broken Hill (about 18,000 and decreasing). It will be 550kms from a decent sized population centre (Adelaide). Line losses must be a thing of the past. AGL is the same crazy crowd wanting to shut Liddell. This concept is almost as crazy as fans to cool the GBR. Is there some competition going on in the taverns to come up with the craziest scheme? Isn’t it El Niño that cause the worst of the bleaching and isn’t that a natural phenomenon which is the reason why the Reef adapts so well to a changing environment and climate just as it’s done for Millenia. Yes robert rosicka, but you have to understand that corals are very, very fragile and can barely survive the merest hint of a sea temperature rise. Consider that the coral atoll of Bikini Atoll only just manage to survive a direct H-Bomb attack before heroically staging a vigorous grow back. Bikini Atoll: 23 nuclear devices detonated between 1946 and 1958 at seven test sites on the reef, on the sea, in the air and underwater for a combined fission yield of 42.2 Mt of explosive power. Those poor delicate little polyps. Oxybenzone. That’s what kills corals. It’s one of the active ingredients in a high SPF rated sunscreen. It only needs to be present in tiny concentrations in the sea water to wreak its fatal effect. There is a plausible basis for thinking noise from wind turbines may lead to adverse health outcomes, such as to warrant further investigation, Victoria’s Administrative Appeals Tribunal has found. An appeals judgment on the charitable trust status of the ­industrial noise lobby group Waubra Foundation said it was not necessary for the AAT to draw conclusions as to the precise ­nature of the annoyance or how it arose. However, the AAT said it did not follow that the Waubra Foundation’s other activities, in particular its responses to requests for information, its support and ­assistance to those complaining of the perceived effects of wind farm sound, and its participation in litigation were also to be regarded as the promotion for the prevention or control of diseases. ***As a result, the AAT upheld an earlier judgment which effectively stripped the Waubra Foundation of its tax deductible status. The AAT heard evidence about the state of scientific knowledge on the possible health impacts of turbines. It did not attempt to solve the issue or rule on whether annoyance may be caused by sound which is not audible (infrasound). The AAT said it regarded as significant that the National Health and Medical Research Council had provided $3.3 million to investigate the issue. Simon Holmes a Court, a senior advisor to the Energy Transition Hub at Melbourne University, welcomed the tribunal’s decision as “the final nail in the coffin for the Waubra Foundation”. Cape Wind, the offshore wind project off the coast of Massachusetts that drew the ire of the Kennedy and Koch families, is officially dead. Energy Management Inc. has ceased efforts to build what was once expected to become the first offshore wind farm in the U.S., according to an emailed statement from Chief Executive Officer Jim Gordon. The project’s Boston-based developer has already notified the U.S. Bureau of Ocean Energy Management that it has terminatsed the offshore wind development lease it received in 2010. Cape Wind suffered a slow death. Efforts to develop the 468-megawatt offshore farm, proposed to supply power to Cape Cod and the islands of Martha’s Vineyard and Nantucket, began in 2001 but came up against relentless opposition from a mix of strange bedfellows including the Kennedy family and billionaire industrialist William Koch. While Energy Management won several court battles, the project couldn’t survive the 2015 cancellation of contracts to sell its power to local utilities. Cape Wind, which called for as many as 130 turbines in Nantucket Sound, once appeared to be on the vanguard of clean energy in the U.S. The project had a federal lease to develop an area 5 miles (8 kilometers) off Cape Cod. Spread over 25 square miles known as Horseshoe Shoal, it could have generated enough electricity to power 200,000 homes, according to the U.S. Energy Department. The $2.6 billion project also had backing from powerful players. Cape Wind had a conditional $150 million loan guarantee from the Energy Department. Mitsubishi UFJ Financial Group, Rabobank Group and Natixis SA agreed to lead a $400 million debt package. And Siemens AG was considering a $100 million equity investment. In the end, however, opposition proved insurmountable. While environmental groups argued that it would reduce the region’s reliance on fossil fuel, critics — including owners of local shore-front estates — countered it would spoil views from Cape Cod and disrupt fishing areas. In the meantime, the offshore wind industry slowly began to take off in the U.S. Deepwater Wind LLC completed the first project in 2016, a 30-megawatt wind farm south of Block Island in Rhode Island waters. Norway’s Statoil ASA is planning one in New York, off the Long Island coast, and developers have proposed several other projects up and down the East Coast. Several of the developers have said they learned a key lesson from Cape Wind: don’t try to build within sight of shore. And furiously fanning the sea around corals will help them? Stirring up water around the corals as more gases from the air get dissolved into it. Does that help or hinder coral life? It must be an experiment, to see how fast coral can be further damaged. where’s Ned Kelly when you need him? GLENROWAN West residents have vowed to do everything they can to stop a planned $170 million solar farm from being built on their doorstep. The proposed ESCO Pacific solar farm would sit on a 245ha site with its 360,000 east-west-tracking solar panels capable of generating 120MW of electricity — enough to power 40,000 homes. “The electricity is fed into the national grid, so locals don’t get cheap power. It also provides very few ongoing jobs,” Mr Cutler said. “Who is responsible for regeneration, who carts away the panels if it turns into a white elephant,” Mr Cutler asked. PIERRE – The South Dakota Public Utilities Commission turned down the request from Crocker Wind Farm for reconsideration Tuesday. Commissioner Chris Nelson received “yes” votes from commissioner Gary Hanson and chairwoman Kristie Fiegen to reject it again. The panel halted the Clark County project Oct. 25. One reason: Crocker Wind Farm submitted multiple layouts for where its turbines would be. Oddly enough I haven’t heard anything more about the solar farm since the project was announced , its about six kilometres away from me where they want to build it. There is another one being planned for ages just the other side of Wangaratta but have no idea on that one either . Don’t read the local rag as it’s coloured green these days . Well it seems we have come full circle in the scientific stupidity stakes. Not so long ago there was another climate gold rush as numerous outfits thought they could skim lots of cream from the tax payer cake by proposing to extract emmissions free energy from the sea using wave riders, undersea turbines [ which I think lasted less than about a week up Scotland's way and cost a few million pounds ], sausage shaped devices that bobbed around in the waves and pumped air to a propeller system on shore I think, sea floor mechanical capets to capture wave pressures, Buoys anchored to the sea floor and bobbing up and down whilst reeling a cable that drives a generator in and out [ the atmospheric version is the Kite generator ] floaty things that use flaps to push air in and out past a big propeller and etc. None of the above have worked or have worked for more than a very short time due to the always aggressive, abrasive, turbulent and non laminar flows of a saline ocean plus other chemical factors that etched away at anything and anything that those scientists presented to the ocean, plus the aggressively hungry free riding sea creatures of every concievable type and description which having found a brand new substrata so generously supplied by all those tax payer scamming ocean generator entrepreneurs to attach themselves to. And did so with relish and in vast numbers thereby making a complete mes and debacle of all the claims of those scientific believers in theri own invincinbility and that they were a whole lot smarter than all of mankind twho had had been there and done all that that innumerable times before. Now at long last we finally have found another bunch of do -gooder, get our names up in lights, fund scamming, impractical, ivory towered, academic silo dwelling cowboys who are going to save the 3000 odd kilometres of the GBR from a fate worse than death, a fate destined to occur regardless so some claim from acidic ocean effects fro created by that deadly atmospheric gas CO2 that has been increasing in the atmosphere. Thats if we are expected to believe yet another grandiose and self serving claim from those creators of the long running climate catastrophe sci-fi fiction, of a deadly gas that sooner or later and later and later will wipe out life on earth. Now those delirium affected scientific geniuses instead of trying to extract energy from the ocean are going to use force involving lots of [ fossil fueled ??? ] energy to drive big underwater fans to mix the deep cooler waters 30 metres down off the GBR with the warmer waters at the surface so that the corals and the GBR can survive that man made warming that nobody can detect or prove or measure as yet and probably never will in this generation’s life time and no doubt, for many life times ahead. Of course just waiting for small cyclone or two to come ashore across the reefs of the GBR mixing the waters right on down and drawing heat from the top 20 or 30 metres of water to drive the heat engine that is a cyclone and piling on in right behind the cyclone to see what effects the colder water has on the corals never seems to have occurred to this lot of two celled scientific whackos. But then of course we must do everything we can to save the Reef! Ahead of the International Solar Alliance (ISA) summit in India in early 2018, Australia has joined the alliance as it officially came into force on Wednesday. “Australia’s expertise in solar technologies and research will be shared globally with the formal creation of the International Solar Alliance today. The International Solar Alliance, championed by India and France, came into effect Wednesday, aiming to promote affordable sun-powered electricity to its members through global tenders and cheap financing. The inter-governmental agency, which has been ratified by 19 countries and has 46 signatories to its framework agreement, aims to mobilize $1 trillion of low-cost financing for solar energy by 2030, Upendra Tripathy, interim director general of the alliance said in an interview in New Delhi. A UK company, http://www.tidalenergyltd.com , produced underwater fans to make electricity and are now in administration. An Aussie company uses electricity so underwater fans can move water. Unbelievable. Only difference is tax payers money supports the, ahem, enterprise. Struggling U.S. solar panel makers on Wednesday made a final plea to President Donald Trump’s key trade policy advisers to support steep tariffs on foreign-made solar products, ahead of his imminent decision in a closely watched trade case. Suniva and SolarWorld, which say an influx of cheap solar panel imports from China have made them unable to compete, appealed to the Trade Policy Staff Committee to recommend stiffer measures than proposed by members of the bipartisan International Trade Commission (ITC) in October. Critics of imposing tariffs on solar panels used a signature policy priority of President Donald Trump to make the case that imposing that trade protection would be harmful to American businesses — and they say it’s already having an impact. Adopting the proposed tariffs “will hinder, not help, American manufacturing,” Henry McMaster, governor of South Carolina, said during a hearing at the U.S. Trade Representative’s office Wednesday. Suniva urged Trump to impose higher tariffs than what the independent ITC recommended. I could not see any mention of an environmental assessment of the effects of mixing bottom water ( with its associated fauna) with reef water (with vulnerable polyps). Can one be certain that no larvae are disturbed that might acquire a taste for coral fauna? Was it not Queensland that introduced cane toads into Australia as a “green” control of the pests on sugar cane? How does the Climate Change industry manage to blame regular coral bleaching on increased CO2? Is every variation in water temperature now due to CO2? Where is the rapid, runaway increase in air temperature promised for 30 years? The seque blaming every change in the environment on the steady CO2 increase is amazing and completely without explanation. Every hurricane, every storm, every bushfire and soon even El Nino and La Nina will be due to CO2. There is not even the slightest attempt at any science anymore. The oceans stole my warming seems to be the story. However these must be the last days of desperate Climate Change, where even the Pope tells us we only have another ten years to prevent Armageddon. How many times have we been given ten years? Prince Charles did it in 2009 “The Prince of Wales is to issue a stark warning that nations have “less than 100 months to act” to save the planet from irreversible damage due to climate. Ho hum. Expires in 15 months. I thought Armageddon was a certainty and the basis of many religions, God’s punishment for our evil ways, so perhaps Christianity and man made Climate Change have become the same thing? Perhaps we should be praying and donating, not keeping prawns cool in summer at public expense. As an retired Electronics Engineer my reaction is this is an insanely stupid idea. The GBR and all the creatures and other things that depend on the GBR environment to be what it’s been may not take very well to this EXPERIMENT. If the fans are an actual attempt to increase tourism, then mermaids waving palm fronds would be an elegant solution. In the “what can possibly go wrong” file, I wonder if the authors have considered to solubility and decomposition of calcium bi-carbonate at warm and cold temperatures. Calcium bicarbonate is stable in cold sea water but when its brought to the surface and mixed with warm seawater, the bi-carbonate breaks down releasing CO2 and depositing calcium carbonate. Their ant-bleaching system is likely to leave the reef covered in white powder. I think they have this problem on occasion on the west coast of North America when cold water wells up creating giant white clouds of precipitate and choking oysters and other mollusks. The law of unintended consequences doesn’t apply they are saving the planet one Reef at a time . Australians must have more money than they know what to do with. Commonwealth Government debt of circa $600 Billion. Annual budget deficit of circa $37 Billion. Yep. We’re all idiots for putting up with it. But what would you expect from the Turnbull left-wing spend-a-thon idiots? Maybe the Australian Labor Party will fix it, as it did under Hawke and Keating in the 80s? I’ve seen the same thing being used on the Thames, but it isn’t to cool the waters. It is to aerate them, since the lower levels can be low enough in oxygen to harm the fish. The technique only works in confined & low-flow environments like rivers & lakes. The GBR is neither, it is on the edge of the open ocean and has a considerable intake of fresh ocean water daily. I don’t know what would happen if you suddenly pumped a lot of hot (and therefore low in oxygen & nutrients) water down on top of the corals, displacing the cold (and therefore high in oxygen & nutrients) water. I think it would be quite harmful. We Australians spent full time salaries and expenses on 350 CSIRO staff to investigate and prove man made Global Warming and Climate Change. Lets say 3,000 man years with expenses, perhaps $4,000,000,000. So, what was the result? A brochure? Now they are working on fixing the terrible consequences of CO2 caused man made Global Warming now known as Climate Change. When can we expect results? How long do Australian coral polyps have to suffer? Has our government just gone mad, public servants spending our money on crazy schemes, ideas without merit? Worse, the massive expense does not have to be justified, before it happens, when it happens and after it happens. We, the people whose money is taken, are expected to turn off our airconditioners, work harder, keep quiet and not question. This is not a democracy. Taxation without justification, without explanation at any time. It is wrong. The government and the public service and the CSIRO in particular are stealing our money so they can play games in paradise at our expense. It is just 500 years since Martin Luther asked what was happening to the money and demanded an end to the robbery, the pretending, the carbon indulgences. Man made Climate Change is not happening. The poor are being taxed for nothing. Just building machines try reversing nature at the Barrier Reef is wrong. King Canute could not turn back the tide. His public service went ahead with the scheme anyway, wasting thousands of chairs. Our government must be answerable for this incredible waste. Don’t forget the opposition, they were in government for a while and are responsible too. I think I’ll go out and work in the gardern for a while . . . . . .
Look out for Don Burke. I refuse to use the word responsible in any connection with the current Labor mob. Don’t use the word “labour” in relation to the labor mob. Didn’t realise we had an opposition! What we have now is an LNP/ALP/Greens coalition, with social engineering policies at the forefront, record debt never to be mentioned by anyone and penalising the middle class at every opportunity. We have even reached the stage where they have purposefully made heating/cooling your home a luxury reserved only for the well off! Unrepresentative swill is an understatement. Its a pseudo Marxist consortium, Cultural Marxism wears a green cloak. It was interesting to read Delingpole’s history of the Green Nazis, vegetarian Hitler and tree and forest worship and the occult. Germany has been the engine of this Green political movement since they lost WWII. So it is not just Marxism, which had nothing to say on trees. The Greens may be better described as the ongoing Nazi party. Amazingly they pretend to be socialists, as did Adolph and his socialist party. Is Merkel’s Germany the Fourth Reich? Amazingly they pretend to be socialists, as did Adolph and his socialist party. They didn’t pretend. He and it were. And it’s not April Fool’s day? Who is the federal government minister who approved this waste? Heads should roll, and this minister should be sacked. If not, voted out. Humm, so the cold water below is drawn up to limit natural symbiont shuffling, and the cold water is presumably replaced by warmer water from above thereby disrupting the ecosystem at 30m below, and this also means that some people, typically the most vulnerable, are prevented by rising electricity costs and/or rationing from keeping themselves at a reasonable temperature. Have I missed anything? Typical of government interventions, the law of unintended consequences means that none of the desired objectives are actually met, while the downsides are spread far and wide. The non touristy parts of the reef can go to hell —- or not? Personally, I find air conditioning works better than fans at cooling down the house. In addition to cooling the GBR with fans we could go to a dental technician and have a set of teeth made for the Great Australian Bight. The fans remind me of a comment made by a Japanese accountant during a very busy end of financial year period: “very big rotation but dangerous”. When I saw the headline I thought it was a joke. It was. And still is. What a spectacular PR gimmick! Apart from the insane waste of tax dollars it does provide a good laugh. On the bright side, assuming this system will actually do anything measureable, it will be interesting to compared the fanned with the unfanned areas. Not just the coral but the whole ecosystem. Would be even more interesting if somebody objective did that research. Oh well. I guess, even for a coral reef, to have fans. What’ll happen when the ship hits the fan? Just lost for words to descibe the futility of this story. Wind turbines work so why not ocean fans. That’s not “sarc”. That’s paradox. They have been there, done that and have left without the T shirt and their trousers as well it seems. Somebody asked that question quite some time ago and then came up with the answer at a good lord only knows what cost and expense on the part of the British tax payer. And in keeping of course with the universal mantra of just about every renewable energy project that has ever been thought of [ outside of hydro power,] “it seemed like a good idea at the time “. Atlantis Resource Corporation redeployed the AK-1000 tidal turbine at the European Marine Energy Centre (EMEC) in Orkney, Scotland, in August 2011. The turbine will undergo tests for two years and will then be deployed on a large scale in Pentland Firth. The breakthrough technology, which was originally slated to be commissioned in August 2010, got delayed due to a manufacturing defect in the turbine blades. The turbine is deployed in the seabed and stands 73ft tall. The simple and robust turbine weighs around 1,300t. It is the largest and most powerful tidal power turbine in the world. A horizontal axis turbine, it is effective in water current speeds exceeding 2.6m. The AK-1000 is designed to subsist in harsh weathers and rough, open ocean environments. It has the capacity to generate 1MW of electrical power from a renewable energy source. The turbine is 22.5m high and can provide electricity to more than 1,000 homes. Two sets of blades are fitted on a single unit of the AK-1000 tidal turbine to tackle reflux and flood tides. The diameter of each blade is 18m, and they rotate slowly at a rate of six to eight revolutions a minute, resulting in zero environmental impact. From memory the under surface turbine provided some power for about a week or so before its electrical system develped a fault which could not be corrected. Despite the claim of a replacement for the Mk1 turbine by a Mk2 turbine there doesn’t seem to have been any further progress in this just another completely bizarre hideously expensive Renewable energy project as per the 2016 up date above from the supervising authority. Olympics?’ Used sky mirrors with climate change results. Ended up with Summer Olympics swimming and diving events? …And to think they showed it on the BBC. Those big, floating thingamabobs look expensive AND fragile, rather like the hundreds of pilot wave-energy installations that were built, installed and almost immediately sunk by storms. It’s a good job the Barrier Reef area doesn’t suffer storms or cyclones then. China’s government has allowed some northern cities to burn coal in a temporary policy U-turn, as the country faces a heating crisis. But millions are reportedly now left without proper heating, after failing to switch from coal to other fuels in time for winter. Chinese media reported on Thursday that the environment ministry had issued a directive to 28 cities across north-east China. The statement said the ministry had “discovered that in some areas, works to replace coal with electricity or gas had yet to finish according to plan, and there were anxieties about fuel sources to provide heating”. It said that such areas would be allowed to burn coal for heating, adding that in their transition away from coal, they must “continue to ensure that the number one principle should be keeping people warm in winter”. In one Hebei province primary school, classes have moved outdoors as students seek the warmth of the sun. They are among 11 primary schools in Quyang county without heating. One father, Li Chaoxi, told the BBC that pupils were asked to bring corncobs to school to burn in order to heat their classrooms without violating the coal ban. “It’s heart-breaking! It was like that when I went to school decades ago; and it remains the same for my kid?” Li said. Others are silent. fearing eviction. In Beijing’s Shunyi art district, a gas pipeline installation won’t be completed until next year. “We can’t complain, can’t cause trouble to our compound,” said a resident who asked to remain anonymous. But with subzero temperatures in some areas, many have voiced outrage and disappointment online. On Thursday a commerce ministry spokesman said that gas imports are set to rise with new gas pipelines and liquefied natural gas terminals on the way, in remarks reported by state news agency Xinhua. But the state-owned Chinese National Petroleum Corporation has warned that the country might face further shortages of gas if the country is hit with “extreme” cold weather, Reuters news agency reported. earlier piece I forgot to post. love the usual faux CAGW concern for the poor, and blame for the middle class! Shipments into the world’s top coal importer reached 22.05 million tonnes in November, up 3.6 percent from October, but down from 26.97 million tonnes a year ago, data from the General Administration of Customs showed on Friday. The figures include lignite, a type of coal with a lower heating value that is largely supplied by Indonesia. “Coal traders are seeking cheaper fuel from overseas markets as miners in China have been ordered to cut capacity to tackle environmental and safety inspections,” said Zhang Min, analyst at Sublime Info. Coal prices in China CZCcv1 have risen steadily this year, touching their highest since at least 2015 at 688.8 yuan ($104.07) a tonne on Dec.4. Utilities in northern China have been running at full tilt since November as households crank up heating systems for winter, while a plan to convert many cities to cleaner fuels has run into headwinds. The Ministry of Environmental Protection recently told local authorities that have not converted to gas or electric heating that they may burn coal or other fuels, media reported. “Coal imports are expected to go up in December since many domestic coal miners are choosing to halt production for maintain (maintenance? ),” said Zhang, adding that the suspension may involve about a third of monthly output. The increase in Chinese coal imports is from Indonesia. Australian exports to China have been down a bit (thermal and coking). Environment Minister Catherine McKenna says getting China into Canada’s international alliance to wean the world off coal power would be a huge win, but the world’s most populous country can’t make that kind of commitment right now. McKenna is in Beijing this week as part of Prime Minister Justin Trudeau’s China trade mission. But while she has discussed coal with Chinese officials, getting them into the alliance is not on the table. “I just don’t think they’re in a position to sign on yet,” she said. Twenty nations signed onto the Canada-United Kingdom Powering Past Coal Alliance at the United Nations climate change conference in Germany last month. None of them are among the world’s biggest consumers of coal power, such as China, the United States, India, Germany and Japan. McKenna acknowledged having China at the Powering Past Coal Alliance table would be hugely beneficial to bringing the rest of the world into the coal-phase out plan. Catherine Abreu, executive director of Climate Action Network Canada, said while China should get credit for agreeing to cancel more than 100 planned coal plants at home, Chinese companies are still one of the biggest players in building coal plants internationally. Germany’s Urgewald environmental group tracks coal plants and says there are 1,600 new plants being planned in 62 countries. Chinese power companies are behind 700 of the plants, and about 140 of those are not in China. Abreu said if Canada and the United Kingdom want their anti-coal alliance to have a real impact, they need to have difficult conversations with China about cutting back its international coal plant construction plans. Catherine Abreu – who are you to tell China what to do? China’s natural gas imports in November rose to a record as domestic demand surged while crude imports were the second-highest ever, as refiners ramped up output to cash in on strong profits as fuel prices soar, customs data showed on Friday. November gas arrivals, including pipeline imports and liquefied natural gas (LNG) shipments, hit 6.55 million tonnes, breaking a previous record of 6.1 million tonnes last December, data from the General Administration of Customs showed. State energy firms stepped up imports months ahead of the heating season that started mid-November, with CNOOC, the country’s largest LNG importer, employing floating tankers as emergency backup and China National Petroleum Corp on Thursday warning of potential shortages. Crude oil imports rose to 37.04 million tonnes in November, or 9.01 million barrels per day (bpd), up from 7.3 million bpd the previous month, and the second-highest level in history. The data comes after the government recently released an additional 1.5 million tonnes in 2017 import quotas to three independent refineries. Year-to-date crude imports rose 12 percent to 385.98 million tonnes or 8.44 million bpd. And the Greens keep saying that China will soon be a low emission zone. Are the increases in fuel in any way related to lwer temperatures? Actually China’s CO2 emissions have somewhat plateaued or even declined over the last couple of years (see link below). I presume that’s because they are building huge numbers of nuclear and new generation coal fired power stations, and shutting down their old and less efficient coal fired power stations. We should do the same if we are to remain competitive and at the same time be good little boys in the eyes of the CO2 police in Paris. Otherwise, forget Australia – it’s heading for an economic disaster way before any supposed global warming disaster. China is ahead of schedule on its way to becoming the second-largest importer of liquefied natural gas. The following article was originally published in the Global Times, usually seen as a Govt mouthpiece (though not so much the English version). ***Wikipedia: It is widely regarded by historians that The Great Leap resulted in tens of millions of deaths. A lower-end estimate is 18 million, while extensive research by Yu Xiguang suggests the death toll from the movement is closer to 55 million. As yet another freezing winter currently descends on northern China, heating for many households in Hebei and other provinces in the region remains turned off. Hebeinews.cn, the official website of the provincial government of Hebei Province, has recently been swamped with complaints from local residents about the lack of heating. “We have had no heating since November 28. We consulted the gas company and they replied that gas is in short supply. No schedule about the restoration of gas was revealed,” a resident from Shijiazhuang posted on the website. “Many residents have started returning to coal briquettes or canned gas to cook,” the resident goes on to say before desperately calling on the local government to solve the problem. The impact of this emergency is already causing anxiety among local residents and industries. The Affiliated Hospital of Hebei University in Baoding city recently received a notice limiting their gas supply to just 2,729 cubic meters. The hospital said it requires at least 20,000 cubic meters to ensure the continuation of normal operations and medical procedures, treatments and sterilizations for its daily 3,000 in-patients, including over 200 infants and children. More and more people are publicly questioning the logic of pushing forward gas use in the nation even though different regions, particularly rural areas, have complicated situations to consider. “It is not realistic to promote gas use in rural areas due to their complicated topography. The cost in laying pipelines, maintenance and safety controls is huge. Besides, the cost of gas is expensive for farmers,” Liu wrote. “The rural area in the north is vast. It is not suitable to blindly and simply copy what is suitable for a city in those areas. Whether it is Hebei or Henan, these regions have their own geographical features and living habits. Making sweeping changes will only increase the cost,” he added. But the annual increase in gas resources will be utterly unable to provide the 30 billion cubic-meters increase in China’s gas consumption every year. Meanwhile, imported LNG and pipeline gas is limited by factors such as pipeline capacity and gas prices. At present, authorities are not optimistic about any large-scale increase in other gas resources. In 2015, China had only 25 underground gas reserves, accounting for a mere 3 percent of the country’s gas consumption, much lower than 17.4 percent in the US and 17 percent in Russia. And the conga line of politicians. It can only cool by evaporation. That has to mean increasing salinity, maybe insignificant but if this coral is so sensitive????? All that energy expended has to end up as heat. Have the engineers planning this actually had a thought. Perhaps it’s being designed by beaurocrats. Perhaps it’s not even being designed. When it is government money you just purchase whatever the next thought bubble comes up with – regardless of its practicality. So let me get this straight… To protect the reef from natural changes that it has survived for millions of years, we are going to remove the natural gradient of temperatures by sucking cooler water from where the inhabitants are used to it and spreading it at the surface where it will be quickly warmed. I’m confused… aren’t we trying to STOP the oceans warming? How does exchanging cold water down deep for warm water at the top where the cold water can be warmed and sent back down accomplish this? I think it’s what you call a Baldrick cunning plan . Some of these researchers sure come up with some cunning stunts. Magicians wands not to be confused with policemen’s batons. November 2017 was the 29th warmest November in 39 years. What the heck? Look on the bright side. Everyone needs a fan or two, even the Great Barrier Reef apparently will appreciate some appreciators. So why not give them to it and be done with it. It’s only money after all. With the toll of homes destroyed here in california now in the multiple hundreds, all needing to be rebuilt along with the lives those homes represent, not to mention horses burned to death and fire still raging through dry chaparral like I’ve never seen it before, I can’t stop wondering how much benefit the money wasted on climate change could do to help clean up this mess and pay for the monumental firefighting effort. And you in Australia have suffered even worse fires. All for the sake of climate change. And no amount of money can pay for the loss of personal belongings or I’d demand some compensation for that too. Maybe I should anyway. And then I think of all that CO2 the fires have dumped into the atmosphere that makes a joke of carbon footprints carbon sequestration and the biggest jokes of all, Al Gore and the IPCC, I want to slug every last climate change pusher on this earth. And I can’t do it. If there was any justice the UN headquarters in New York City would fall into the East River some dark night and that would be that. But nothing stays around longer than a bad idea. The reef must have fans to placate the nuts who can’t think straight. I’ve been wondering how you are Roy? It’s a nasty business for you. Annie, thank you for thinking of me. We’ve been spared all but a little smoke. The fire has stayed safely away from us. But the damage has been worse than I’ve ever seen before. Surely an environmental impact study will be required under both Cwth and State legislation?